The new Apex Legends update is here and the patch notes should be plenty pleasing for anybody who likes a larger legend, rocking a sniper, or hanging out in the drop ship longer than five seconds. 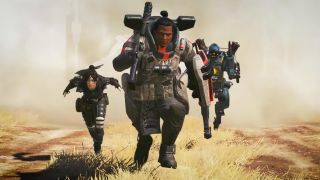 Apex Legends update 1.1.1 went live on Tuesday with some of the biggest balance tweaks yet for the two-month-old game. We've pulled out three of the biggest changes to the game and how they'll affect your matches right here, but you can scroll on to see the full change log for yourself. Poor Gibraltar and Caustic have been relatively unpopular in Apex Legends since launch for one simple reason: they're too big. They're waaaay easier to hit than teensy characters like Wraith and Lifeline, but they aren't otherwise powerful enough to make up the difference. Pathfinder had that problem too, but Respawn Entertainment was able to bring him up to spec with some refinements to his hitbox. The two big fellas needed some extra help, and now they have it in the form of a new passive perk: Fortified, which reduces all damage taken by 10%. Respawn says it will "aggressively tune" this ability in the next couple weeks if they still feel underpowered. Plus, Caustic's gas now deals four times as much damage per tick and Gibraltar's gun shield has 50% more HP. Everybody moves so damn fast in Apex Legends that sniper rifles have always been tough to get damage (let alone kills) with. Character speed isn't changing but weapon sway is, which should make it easier to at least line up shots. You'll also only deal 10 percent less damage for landing a leg shot with a sniper rifle rather than the big ol' 25 percent reduction you got before. It's not enough to turn Apex into a sniper's game but it should make extra-long-range combat more viable. Also of note are further nerfs for the Wingman pistol: now it will start with only four rounds per magazine and top out at 10 rounds with an epic magazine extender mod equipped. Speaking of Apex Legends being fast, why not make the jump ships faster too? Respawn Entertainment gave the match-starting vehicle a 50 percent speed boost in the latest patch, so it should be less of a boring wait if you want to land on the far side of the map. If we're lucky this will also means fewer impatient squadmates furiously pinging the map and/or dropping on their own. Below, we've outlined the latest patch notes from the developers.